The aforementioned visual comparison to Ghoul does go a little deeper than skin level. 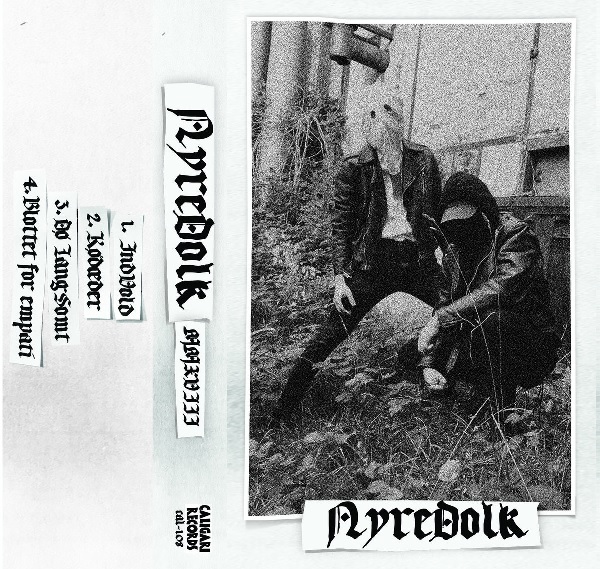 While that mixture of Impaled members plays a combination of death and thrash with some surf/rockabilly elements, NyreDolk take on a black metal and punk/crossover thrash approach that puts modern Dakthrone on notice. “Indvold” kicks things off with a mesmerizing drum performance reminiscent of patterns sometimes found on King Diamond‘s House of God album before shedding its skin into some lighter punk influence that does lose some of the venomous enthusiasm, yet still feels right at home nestled in the more analog quality of the release. “Kadaeder” really amplifies that distortion to near-Uncle Acid & The Deadbeats levels, carrying a catchy enough rhythm and minor sludge output at times that can seem a bit too busy about halfway through, especially as the paces slows for the guitar solo. While not the most impressive of the four songs, it does bulk up enough to at least hold your attention before the implosive conclusion. And then there’s the final track “Blottet for Empati”, which stands as their darkest creation, as well as most suiting manner to end this gritty and often bleak slab of blackened rebellion. The haunting leads that come towards the end after a blistering start that whips at the listener with a hypnotic drum presence behind the thick guitars and echoing vocals come really close to mimicking an eighties synth score to a horror film of that era, screaming for fans of Necrophagia to latch right onto. Overall, NyreDolk‘s debut demo is one worth taking note of, but, sadly, while impressive it does start to lose its appeal after a few spins. This is thanks largely to a similar drum pattern that creeps up throughout the four compositions, diluting some of the hostility on display when it creeps its ugly head into the mix. Thankfully that’s the only truly major issue to be had on this Demo release. So, if you are a fan of any bands listed above, you will find plenty of reasons to throw this just over thirteen minute offering back in from time to time. Given a little more time to explore their musical abilities and feel out the direction they want to take from the surprisingly varied offering, this two-piece can become a pretty noteworthy contender within the black metal underground.